The University of Cambridge Department of Engineering is the largest department at the University of Cambridge and one of the leading centres of engineering in the world. The department's aim is to address the world's most pressing challenges with science and technology. To achieve this aim, the department collaborates with other disciplines, institutions, companies and entrepreneurs and adopts an integrated approach to research and teaching. The main site is situated at Trumpington Street, to the south of the city centre of Cambridge. The department is the primary centre for engineering teaching and research activities in Cambridge. The department is currently headed by Professor Richard Prager. In 1782, the Reverend Richard Jackson of Torrington, former fellow of Trinity College, died leaving a substantial portion of his estate to endow a Professorship of Natural Experimental Philosophy. This became forerunner to the Professorship of Mechanism and Applied Mechanics, first held in 1875 by James Stuart. Cambridge University Engineering Department Trumpington Street site looking southeast from the Inglis A Building in Nov 2004. 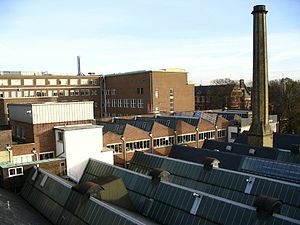 The Baker Building is in the left background and the Leys School is in the right background (behind the chimney). The Inglis Building is in the middle and foreground. The main buildings are located at Trumpington Street and Fen Causeway on the Scroope House site, where most of the undergraduate teaching in the Engineering Tripos is carried out. Various sections which could not easily be accommodated on the main site have moved to the university's West Cambridge site, including the Whittle Laboratory (a turbomachinery laboratory, founded by Sir John Horlock, in 1973), The Geotechnical Centrifuge laboratory, the Microelectronics Research Centre (1992), the Electrical Engineering Division building and the Institute for Manufacturing (IfM). A few of the smaller buildings on the Old Addenbrooke's Site, in Trumpington Street opposite the Scroope House Site, have been used by the department from time to time. Currently, the Cambridge Programme for Sustainability Leadership is in the end building of that site, 1 Trumpington Street, having expanded and moved there under its previous name of Cambridge Programme for Industry in 1991. In 2016, the construction of The James Dyson Building was completed in front of the Baker Building - providing additional office space, and seminar/meeting rooms for use by the department. Over the course of the next 10 years, the department plans to consolidate the Department of Engineering entirely on the west Cambridge site. John Baker, developer of the plasticity theory of design. Sir Christopher Sydney Cockerell, English engineer, best known as the inventor of the hovercraft. John Hopkinson, patented the three-wire system for the distribution of electrical power. Sir Charles Edward Inglis, under whose leadership the department became the largest in the university. Sir Bennett Melvill Jones, who demonstrated the importance in streamlining in aircraft design. Ian Liddell, designer of the Millennium Dome. Charles Oatley, developer of one of the first commercial scanning electron microscopes. Harry Ricardo, major contributor to development of the internal combustion engine. Andrew Schofield, pioneer in centrifuge research. James Stuart, first true professor of Engineering at Cambridge appointed in 1875. Constance Tipper, metallurgist, crystallographer and first woman to serve full-time as faculty in the department. Carol Vorderman, former Countdown host and mathematical television personality. Frank Whittle, inventor of the jet engine. Reverend Robert Willis, the first Cambridge professor to win an international reputation as a mechanical engineer. Cambridge University Eco Racing, a student run team which designs builds and races solar electric vehicles. Innocent Drinks, best known for the Innocent Smoothie brand. Cambridge Consultants, an international technology development and consultancy company. Cambridge Scientific Instrument Company, first manufacturer of the scanning electron microscope. There are about 1,200 undergraduate students in the department at any time, with about 320 students admitted each year. The first two years are essentially the same for all students and aim to give a broad overview, covering mechanical and structural engineering, as well as materials, electrical and information engineering. From the third year, students are required to specialise, undertaking either the Engineering Tripos or Manufacturing Engineering Tripos. Meanwhile, the Manufacturing Engineering Tripos provides an integrated course in industrial engineering, including both operations and management. The Department of Engineering currently has about 190 faculty and PI-status researchers, 300 postdoctoral researchers, and 850 graduate students. Post-graduate education in the consists of both taught courses and research degrees (PhD, MPhil and MRes). The majority of research students study for a PhD degree while around 10 per cent follow the one-year MPhil (research) programme. The department also has a number of Engineering and Physical Sciences Research Council (EPSRC) Centres for Doctoral Training (CDTs), which follow a 1-plus-3 year model where a one-year MRes course is followed by a three-year PhD. Full funding for four years is provided through these centres. In addition to the CDTs, the department has a limited number of EPSRC PhD studentships available for British and EU students. ^ "Strategy and Development Plans - Department of Engineering". Retrieved 31 March 2017. ^ "David Cardwell - Department of Engineering". Retrieved 31 March 2017. ^ a b (paul@jenandpaul.co.uk), Paul Robertson. "CUED 125 Anniversary". Retrieved 31 March 2017. ^ "The AOUG Sir John Horlock Award for Science". Association of Open University Graduates (AOUG). Retrieved 14 April 2014. ^ "The James Dyson Building | CUED undergraduate teaching". teaching.eng.cam.ac.uk. Archived from the original on 2015-01-09. Retrieved 2016-07-17. ^ "Professor David Cardwell interview for Professional Engineering Magazine - Department of Engineering". Retrieved 31 March 2017. ^ "Graduates Overview - Department of Engineering". Retrieved 31 March 2017.